Product prices and availability are accurate as of 2019-03-11 12:19:59 EDT and are subject to change. Any price and availability information displayed on http://www.amazon.com/ at the time of purchase will apply to the purchase of this product. LASCO 0-6109 Hot/Cold Faucet Handle Index Buttons, Fits Kohler Trend, Carefree, Milwaukee and Universal Rundle Brands, Acrylic. 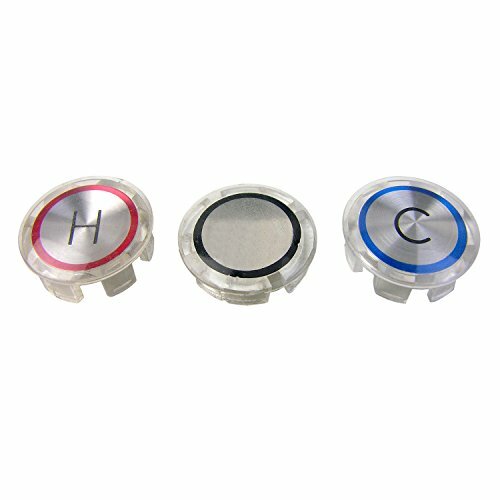 Hot and cold faucet handle index buttons, fits Kholer Trend, Carefree, Milwaukee, and Universal Rundle. Replacement for OEM 30001 and 30002. Dimensions are; 13/16-inch outside diameter by 3/4-inch inside diameter. Larsen Supply a third generation family owned and operated company with over 80 years of experience has the largest retail plumbing line in the industry today with over 7000 packaged and 16,000 bulk SKU's. We pride ourselves on service, selection and support! All Lasco merchandise if warranted to be free of manufacturing defects. Please revert to retail place of purchase for resolution of any possible plumbing questions, warranty or defective part replacement.